In one unit full-high def (1920x1080) movie and still camera (5MP) can be enjoyed with. It is contain camera and housing for all in one package!!! 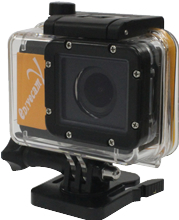 Action Mini DV camera for kinds of Outdoor field!! It's useful not only for scuba diving but also outdoor sports, winter sports, marine sports and so on. It can be used as a drive-recorder. It can be used on your style as you like.